On December 2, 2017 about at 11:00 p.m., a victim was robbed at gunpoint in the 2500 block of Hudnall Street. The suspects assaulted the victim and took property. The victim sustained minor injuries. The suspects are described as three Black males, 17 to 20 years of age, 5’7” to 5’10”, 160 to 180 lbs., dressed in all black clothing. This investigation is ongoing. At this time, detectives have developed information on Persons of Interest regarding the offense and would like to speak with these individuals to determine their involvement. 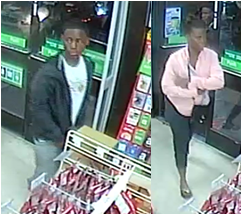 Anyone that recognizes these individuals, or has information on this offense is asked to call Detective Edwards at (214) 671-3674. If you wish to remain anonymous you may call Crime Stoppers at (214) 373-TIPS (8477).